As the final speaker of the their very cool "lunch & learn" Luncheon Series, AIGA-IOWA rolled out an inviting and chill red carpet for me and invited me to speak to their chapter over an extended lunch hour. Held at the refined rustic Jasper Winery, the event was about an hour and a half of good food, chats and commentary surrounding the topic of "Habits of Successful Freelance Designers". It's always my hope that those I speak with always go away with at least a few nuggets of info, but more importantly a vast amount of good communication and motivation to go off and make their own experiences better. I know I sure leave a bit more motivated and almost euphoric as the good vibes take a long time to subside. 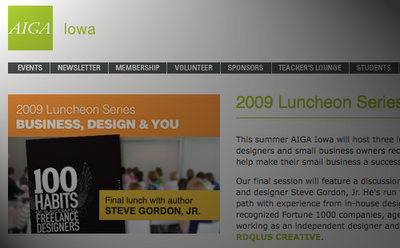 Hey AIGA-IOWA… I'll come back anytime you'll have me. You all are great!